The self-taught musician has garnered 70 million views on YouTube and has achieved numerous top-ten singles internationally. You’ll recognise her for her critically acclaimed collaborations with American rock band, Boyce Avenue. 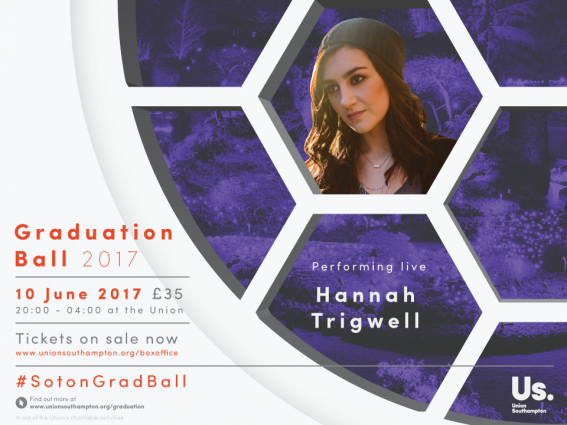 Hannah’s voice has been described as “like finding treasure” (The Guardian) and according to The Telegraph, “Hannah Trigwell could sing the phone book and make it sound dreamy”. The singer, who has supported Jake Bugg and Lawson on tour, is the third act we have announced for our musically eclectic line-up at this year’s Ball. Guests can also expect to see rockers, Don Broco at Garden Court and DJs Tom Zanetti and K.O. Kane in The Cube. We’ll be announcing more exciting acts this week over on our official Facebook event, based on the choices made by this year’s student Grad Ball Committee, so stay tuned!